During the last two weeks our internal phone system was undergoing some upgrades which may have resulted in some of your phone calls not getting through to ClearDent Technical Support. The upgrades are now complete and anyone calling in to ClearDent Technical Support should not have any issues. We thank you for your patience and understanding. Dr. Doug Brothwell, Associate Dean (Academic); Shelly Shultz, ClearDent Consultant; Randal Anderson-Hill, ClearDent Consultant; Dr. Pamela Dahl, Director, CCOH. With a gift of practice management software worth well over $250,000, ClearDent, in partnership with the Faculty of Dentistry’s Centre for Community Oral Health (CCOH), is giving Manitoba’s dental students a glimpse of what their future dental practices may look like. ClearDent introduced the idea of paperless practice to the dental industry with its invention nine years ago. With the software, dentists can do their charting chair-side, using revolutionary touch screen technology that is not only quick and efficient, but also more ergonomic and much better for infection control than other available options. 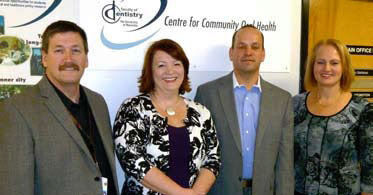 The opportunity to partner with ClearDent was one that CCOH jumped at. And for ClearDent and its Sales Manager, Peter Li, the partnership was a natural fit. Li stresses that the University of Manitoba was ClearDent’s number one choice for a university partner. With one of the largest outreach programs in Canada, Manitoba’s dental school was a perfect venue for ClearDent to introduce its software to a tech savvy generation of dental students, and one in which they could also make a difference in the oral health of those who need help most. By gifting this software, which has been successfully in use in CCOH for three years, ClearDent is able to give dental students experience working in a paperless practice environment. It’s one that could reflect the digital world may work in directly after graduation and may also be something students might wish to emulate as their careers progress and they begin to operate their own practice. At that time, those graduates will be able to draw upon their experience using ClearDent to make an educated decision about the practice management software they consider for their clinic. The University of Manitoba is proud to be able to teach them using one of the best systems available. For instance, Manitoba’s CCOH is the only one in Canada using ClearDent’s touch screen technology. This gives students a real advantage once they graduate. They will be on the cutting edge of dental practice, ensuring that the University of Manitoba maintains its reputation as a top destination for dental education in North America.